The ‘Gilets Jaunes’ protesters in France are clearly not giving up. Although the protests in the capital Paris are not near as massive as previous weekend, thousands have turned out in smaller cities again to voice their discontent with President Macron and his government which they claim favours the rich and taxes the poor. It is however quite clear that the press has been instructed not to show the protests anymore. 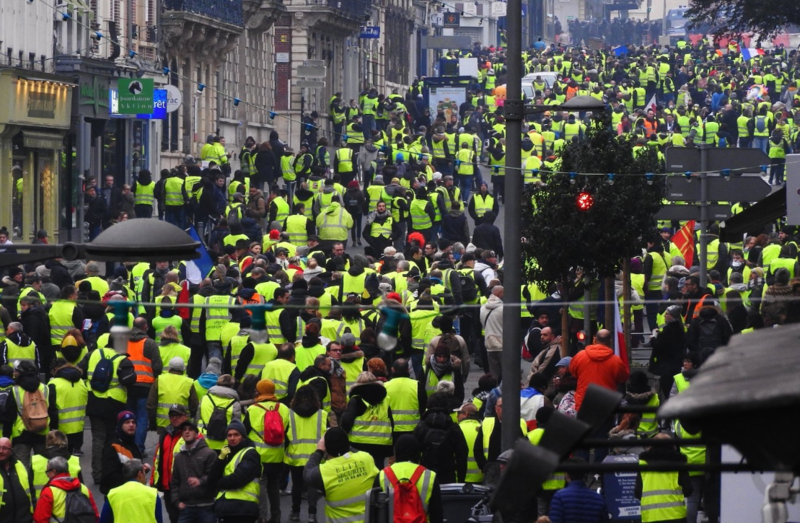 Most media in the French-speaking parts of Switzerland and Belgium (and of course in France itself) are hardly reporting on ‘Acte VII’ at this moment, even though thousands are once again on the streets of Rouen, Bordeaux and Marseille. About a thousand "yellow vests" gathered Saturday morning in front of the triumphal arch of Marseille, wanting to prove that their movement does not stop despite the holidays. Protesters, coming from several blocking points across the region, began to meet quietly around 10 am Porte d'Aix, in the center of the city and walked around the city peacefully. The protest continues in France, but the number of participants is indeed constantly decreasing. The first weekend, 282,000 people were on the streets, on December 22 there were only 66,000 anymore. This time, some 40,000 people showed up to protest. That decrease, according to the movement, is because of the end of year celebrations. They believe that from January on, more people will come into the streets again. Related coverage: France – ‘Gilets Jaunes’ Astonishing Arrest After Shock Decapitation Macron Doll. According to Ms Priscilla Ludosky, one of the spokespersons of the fuel protests, the French government's answers are not sufficient. Ms Ludosky also is convinced that the protests will continue in 2019. “Everyone should understand that we will not stop,” claims Thierry Dumont (51 years old) to the AFP news agency. He fights against the unequal division of the wealth of France. Miss Monica Piazza de Valence (22 years old) also states it’s all about inequality: "we are not against taxes in itself, but it’s always the same who have to pay." The yellow vests are handling their social media outlets more discretely. In order to remain out of the hands of police forces, they are only informed at the last moment where the demonstrations will take place. Since the beginning of the protests in early November, ten people have died and more than 1,500 people have been injured, of whom 50 were seriously injured. Last week, 65 people were arrested, including one of the original spokespersons. WHERES MA 8CHAN JIM YA DOG! GOD DELIVER THESE PEOPLE FROM THE HANDS OF MACRON AND THE GLOBALIST CABAL!! !